Our first effort was to ride the funicular to Pettin Hill. On the way there I discovered a Grand Union at Strossmayerova namesti – all the legs were being used as well as the straight through routes. It is easy to miss the entrance to the funicular as in Valparaiso and it was a hot and unpleasant ride to the top. When we got there we found a nice display of roses but there were no views to be had and no way of knowing what there was to be seen. There was an enamelled map purporting to show the area but this had been turned on its side, there was no compass rose and there was no way of knowing where we were on the map. In addition the map was covered with a large number of red arrows that didn't seem to relate to anything. Exasperated , we gave up and came down and transferred to a 22 tram to try our luck at the castle. It was crowded and we had difficulty in figuring out where everything was. There was a Tourist Information Office but the only humans in there were selling tickets so we were not able to get a plan. At this point we said === it and decided to come back into town – at least we managed this in the same transfer ticket. We found a table in the shade on a terrace on an island in the river and had a drink then lunch. The views from teh island were very peaceful compared to the rest of the city. A short walk brought us the the Frank Gehry building, the Dance House and then caught a tram back to the hotel. The clouds had built up and it began to thunder and rain very hard. We went out later for dinner and found the air much cooler although the sky had completely cleared off. We ate at a restaurant close to the hotel which we had looked at earlier but had suspected because it had such an extensive menu. We went inside, downstairs, and found it was a homey place with not a lot of tables. The waitress was friendly and we enjoyed our meals. Mary had sauerkraut soup like her mother used to make and a spicy goulash. I took my last opportunity to have roast duck which was the best I have had in a long time – moist and juicy but crispy skin. We both had a dark beer which Mary liked but I prefer Guinness. 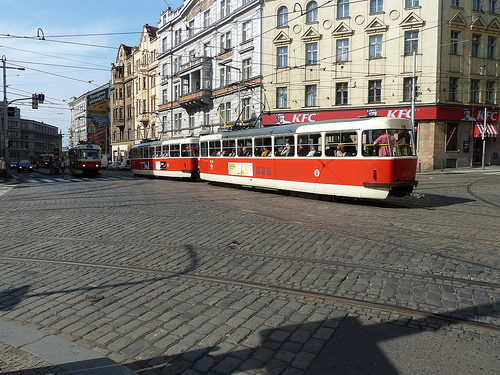 Click above to see pictures of Prague trams.